We’re pretty excited this week about some soon-to-arrive changes in the structure and functioning of the Nerd Watch! It’s a bit early to talk specifics, but basically everything should remain the same for all of you, and get a lot easier for us! That means more time for us to hunt down more obscure events and interesting local folks. It also means more time for us to play computer games, which is a goal we’re pretty certain is universally recognized as the highest good. It’s in Kant somewhere? Speaking of games, you all should check out Nerd Nite next Monday! It’s going to be a great time. The two presenters – Pat King and Hannah Shaffer – are both prior interviewees at the Valley Nerd Watch, and genuinely lovely people to boot. Pat will be talking about his experiences creating an awesome VR music app, and Hannah will talk about the joys of Role-Playing Games! We always have a wonderful time doing Nerd Nite, no matter the fact that we’re intensely nervous the whole night every time. Come one, come all, bring your friends. Also maybe say hi to the host and tell him it’s going well and he did a good job and his jokes are funny. We’re also happy to announce that we’re going to be promoting stuff at the Goodwin Memorial Library! Did you know that there are approximately an infinite number of libraries in the area? This one is the one we drive past literally all the time and somehow never actually looked up for the dang newsletter. Luckily, the Extremely Cool Librarian Katy got in touch with us and told us about how they’re going to be doing a lot of neat things at Goodwin! It’s all starting with Magic: the Gathering weekly on Wednesdays at 3pm starting December 9th! Also just in general we’ve started to get more people getting in touch with us, and we want to be clear that that is completely awesome! 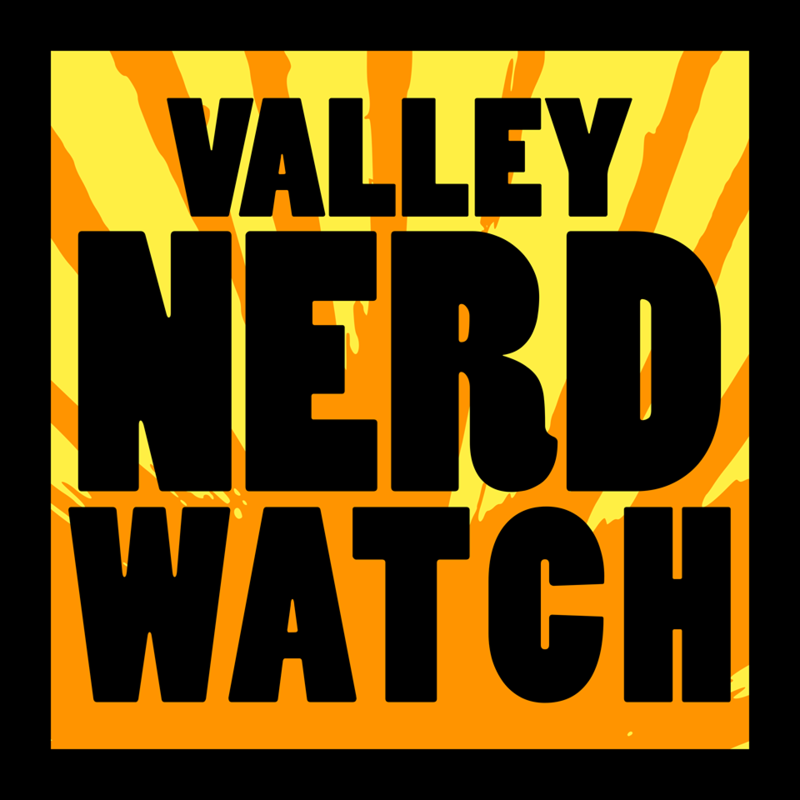 We’re here to help, so talk to us at valleynerdwatch [at] gmail.com, via our Facebook page, or via Twitter whenever you like! As always, be sure to check out the Weekly Events page! There are a lot of fun things happening this and every week! And don’t forget to check out the updated Book Clubs List! And the Valley Creators page! Do your holiday shopping in a way that benefits local creators! Do you care about your rivers? You for real should! It’s easy to imagine they’re fine, but dang do they have a direct impact on your life whether you realize it or not and they’re quite fragile. This event is designed to gather stories for a community art project to bring attention to the necessity of improving the health of our Connecticut River! It’s ours, Connecticut, we only named it after you to placate you. We admit it. We kind of though the anteroom to Comics N’ More was a bit silly. Not many shops have that sort of thing! But dang if they haven’t turned it into something special. A neat little art gallery to display the wonderful work of local talents. Well done, Comics N’ More! Hang out with some delightful geeks as they play some board games. Mostly they do Euro-style strong mechanics stuff, but they’re open to whatever. Might we recommend you bring a copy of Cuba Libre? It’s fun and interesting! Chess! The bivouac of baronies, the blossom of Madrid, the keening gull of dawn! Round one at 10am, then a 4-round Swiss system, and trophies for 1st/2nd/3rd in each section. Free entry! But bring a bagged lunch and a chess set/clock if you’ve got one! Do the words “Romulan Neutral Zone” fill you with a sense of dread and anticipation? Then this event is for you! Figure out how to take advantage of a tense conflict in the Neutral Zone in this super neat Star Trek miniatures game with the friendly folks at Greenfield Games! You’ve got a 120 SP Fleet Build, and it’s a $5 entry fee with prizes! Play a game where you make superheroes fight! Sort of like the upcoming Captain America movie. Or the upcoming Superman V. Batman movie. Hm. Make the movies fight! Batman & Captain America V. Superman & Iron Man! Brilliant. Hosted by Jaime “undoubtedly a cool friendly person” Nolastname. Wes Moore is a youth advocate and veteran plus hosts Beyond Belief on the Oprah Network which means he might know Oprah which means he’s already achieved most of our dreams. He’s going to be speaking about his book ‘The Other Wes Moore’! Erastus Hopkins was a founder of the Free Soil Party in Massachusetts and was a Presbyterian minister in a place that was pretty heavily Congregationalist. He also wrote a bunch, so his great-great granddaughter gathered a bunc hof his correspondence and made a really interesting book out of it! Writer Anne D. Emerson is going to be reading from it and answering questions afterward. Ruth Ozeki is going to be reading from both of her celebrated novels ‘A Tale for the Time Being’ and ‘My Year of Meats’! She’ll also sign copies. We had a year of meats once, it go weird. Ruth Ozeki worked for more than a decade in film and television and her documentaries and dramatic films have been shown on PBS! A new weekly event! Play and learn Magic: the Gathering at the library! Comfortable and friendly, it’s the perfect place to come hang out and duel with other denizens of the planes! Comics! They’re fun and attractive, not unlike every person reading this text. But how are they made, and by whom? We’ve found scant clues, but they point to a mysterious and powerful cabal of smiths who meet each month at this time! Go an gripe about difficulties and crow about successes with people who will appreciate talking to you about comic-making! Laser tag! The sport of earls, the pastime of time-lords, the game of thrones. It’ll be a fun time! We’ve only played laser tag a few times but it’s kind of delightful. Please sign up in advance, grades 5th-8th only! We remember watching Ghost in the Shell and Princess Mononoke as kids and being completely blown away. We never did become an Anime Kid, but we got why people would do that. There’s some great anime out there. And if you’ve never really gotten into it, you can skip to the best stuff! Forbes Library Doctor Who Club! Doctor Alfred “Doctor Who” Whom is known throughout the galaxy as just some guy, you know? All are welcome to hang out and watch the show with folks! Role-playing games! Basically skeletons of mechanics that allow you to more comfortably hang out and play-act with pals. We always love seeing numbers and gauges go up in games, but a good RPG always becomes improv class once you get comfy. Are you a D&D-ster? A FATE-head? A person who likes to play RPGs and would like to find a good group? Today’s the day to hang out! Admission is a $5 day pass, though GMs play free! Go find some adventure! Kerry Ann Lang, Researcher at the Dean Center for Tick Borne Illness will discuss Lyme disease care and prevention! It’s kind of terrifying actually. You know it was only really connected to ticks a few decades ago? And it’s spreading very fast, way more cases now than there used to be! Agh. Ticks. The grossest and worst of the bugs. There’s a Q+A after the presentation! Science! Learn how LED(Light-Emitting Demon) lights work! With the help of Evelyn L. Hu, the Tarr-Coyne Professor of Applied Physics at Harvard Univeristy, you’ll ken the dark rituals needed to bind and control these useful little monsters. Open to all curious folks for free, with snacks and some mystery prizes maybe! A diverse panel of scientists talks about how to broadcast information to the public and make certain people have the ability to make informed decisions! This is important, it’s hard to make complex ideas understood. Minecraft is the weirdest success story we’ve experienced. We’re so used to finding little cast-off oddities buried online in some little itch.io or whatnot, this is the only time we’ve played something cute and obscure and then watched it become a worldwide sensation that 100% of children love. Anyway! There are 15 spots and you’ll need to register at the desk. There will be free play, group games, lots of fun stuff!